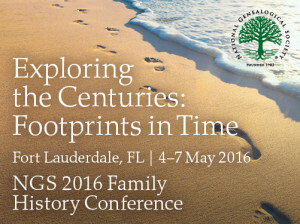 More than a thousand genealogists are in the process of descending on Fort Lauderdale, Florida, for the 2016 National Genealogical Society conference, which gets underway officially on Wednesday with a keynote address by Connie L. Lester. In “Ordinary People,” Extraordinary Lives, she will tell the story of the men and women who battled the heat, the swamps, and the bugs to establish farms, businesses, schools, and the arts in Florida. More, she’ll tell those lucky enough to be there for this opening session how to find their stories and help us understand what those stories contribute to our understanding of who we are. After that opening session, there’s so much to choose from! But, of course, this blog is by The Legal Genealogist, so it should come as no surprise that I’m going to focus on the presentations for conference goers that will help us all understand better the law behind the records we find. 4:00pm: What Did Your Ancestors Leave You? Probing into Probate, presented by Christine Crawford-Oppenheimer, MLS.